I saw a 5:00pm showing of Blue Jasmine earlier, and while there are many different approaches to take when looking at the film- Blue Jasmine as San Francisco film (Joe Eskenazi thought it odd that we saw a San Francisco filled with New Yawkers blabbering on about where to get good clams), portrayal of women and their relationship to men, the role of biological vs adopted family in the movie, class and the financial crisis, well, I just want to use this opportunity to praise Cate Blanchett as one of the best actresses working in the movies today. She has range, she has a regal bearing and a timeless beauty. Meryl Streep who? Take a look at The Aviator, where she won the Best Supporting Actress Oscar for playing Katherine Hepburn (the Academy loves awarding actors for playing historical figures- see Margaret Thatcher, King George VI, Harvey Milk). She captured the essence of the Hepburn that we remember from the screen- the verve and energy, the vibrant wit- while also capturing the vulnerable side of the woman so deftly in the bathroom scene that I believe won her the Oscar (I also believe actors are awarded the Oscar for nailing one scene and one scene only. For The Aviator, she won for this scene showing Katherine Hepburn’s vulnerability). In Elizabeth, she harnesses her regal quality to portray the virgin queen in all her power and complexity. She lost the Oscar to Gwyneth Paltrow, which was a damn shame. Will Cate get the chance to win the Oscar one day? I think so. She is only 44, and has years of good work ahead of her. 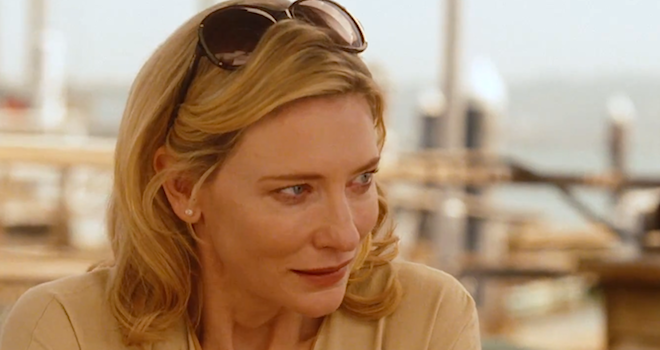 She may even get the chance with Blue Jasmine, carrying the movie and appearing in nearly every scene. As the wife of a Bernard madoff-type big-scale swindler whose life unravels in the wake of his imprisonment and suicide, Jasmine could be an unsympathetic character in less capable hands. She is a fragile, weak, vain, petty woman, but her humanity shines through, due somewhat to skilled writing and directing from Woody Allen, but mostly because of Cate Blanchett’s acting. Will she win the Best Actress Oscar in February 2014? I hope it’s her time.